Wine is often regarded as one of man’s greatest accomplishments. A pinnacle of craft that requires knowledge of soil, weather, geography, geology, grapes, fermentation, and time. You can use the word “terroir” in reference to it, and impress (and perplex) everyone around you. It makes you wait a painstakingly long time before the end results, and then it is subjected to intense scrutiny (using intimidating terms like chewy, earthy, fleshy and jammy). And hopefully, after all of this, it provides “unparalleled” rewards to the human palette. When the findings of a recent study detecting trace amounts of pesticides in French wine hit the press, many a connoisseur’s cork broke off beneath the mouth of the bottle. Let me warn you before you read this, this is a bit of a spoiler…but it’s not as bad as oxidized wine. Or perhaps you know all about this already and want to jump ahead to the AutoMate-Q40 application note related to this topic. Just click here: Pesticide Analysis Using Automated QuEChERS: The Determination of Pesticides in Wine. The Excell Laboratory, which works with wine and food industries in several countries, and runs labs in France, Argentina, Spain and Chile, tested 92 French wines (including those made with organically grown grapes) for pesticide residues. The purpose of the Excell study was to lobby in favor of testing wine, not just grapes, for pesticides, and to draw attention to the number of chemicals in use. The study it is worth noting, was funded by Bordeaux’s nine most prominent estates. 1 The results showed trace amounts of pesticides in almost every bottle, as well as the presence of insecticides and fungicides not permitted for use in the EU.2 A majority of the findings were “well below” toxicity thresholds defined by the European Union. But oddly enough, the European Union (EU) has established Minimum Recorded Levels (MRLs) for table and wine grapes, but not for the wine itself. 1 Regardless, the results must have been disquieting to many wine consumers. In addition to the 2013 study, a 2008 survey by Pesticide Action Network UK found similar results in wines from across Europe (and also included bottles from Australia, South Africa, and Chile). In that study, all 34 “conventional” samples tested showed pesticide residues, while only one of six organic wines exhibited pesticide traces. Because wine is often made with a mixture of grapes from differing sources, which could potentially use different pesticides, the risk of mixed pesticides can occur. Coupled with pesticide’s ability to reside in the environment for a prolonged amount of time, the eventuality of a mixture of different chemicals becomes increasingly likely. This concern is substantiated by the Excell study’s results. Viticulture (the cultivation of grapes) accounts for roughly 20 percent of France's 62,700 tons of pesticide consumption, and 80 percent are fungicides.1 In the case of wine made using organic grapes, pesticide traces can originate from the environment around them. A Risky Red, a Worrisome White? To me, that puts things in perspective. Only 0.3 percent of the wines did not meet current regulations (EU). The study’s results can be found in the AutoMate-Q40 application note Pesticide Analysis Using Automated QuEChERS: The Determination of Pesticides in Wine. Mustacich, Suzanne. Wine Spectator [Online]. May 20, 013, Wine Drinkers Face Little Danger from Pesticides, but Winegrowers Do: A French study found chemical residues in wines, but at low levels; experts hope to eliminate need. http://www.winespectator.com/webfeature/show/id/48474 (accessed October 23, 2013). Ruitenberg, Rudy. Bloomberg.com. September 25, 2013, French Wine Test Finds Pesticides in Each of 92 Bottles Analyzed. http://www.bloomberg.com/news/2013-09-25/french-wine-test-finds-pesticides-in-each-of-92-bottles-analyzed.html (accessed October 23, 2013). Philpott, Tom. Mother Jones [Online]. 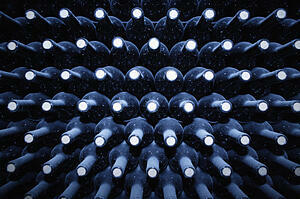 February 22, 2013, 9 out of 10 French Wines Contain Pesticides. http://www.motherjones.com/tom-philpott/2013/02/your-french-wine-has-9-pesticide-traces (accessed October 25, 2013). European Committee for Standardization/Technical Committee CEN/TC275 (2008), Foods of plant origin: Determination of pesticide residues using GC-MS and/or LC-MS/MS following acetonitrile extraction/ partitioning and cleanup by dispersive SPE QuEChERS-method.